Q. What’s the best way to print a calendar from a SharePoint site? A. If you use either SharePoint 2010 or SharePoint 2013, first connect it to Outlook, then print from there. Click into the calendar you want. Make sure the SharePoint page is just the calendar and not just a page that happens to include the calendar and other Web parts. Click the Calendar tab at the top and toward the right on the ribbon for the Connect & Export group, in which you’ll find the Connect to Outlook button. Click it, and confirm you want to complete the operation. 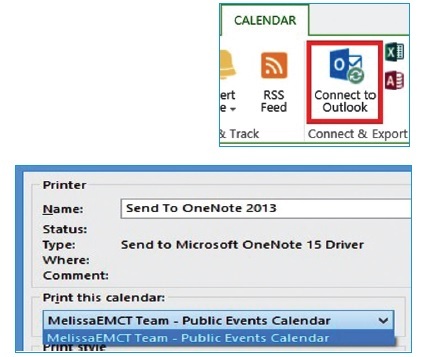 Once it is visible in Outlook, check only the box for the connected SharePoint calendar and click File tab, then Print. If you have multiple calendars showing, from the Print dialog, click the Print Options button and, under Print this calendar, select the SharePoint Calendar. You can continue to maintain the calendar in Outlook if you wish. All changes will be synced when a Send/Receive operation occurs.